Weather risk management has traditionally been addressed by creating design standards based on the recurrence rate of extreme events. For example, infrastructure may be designed to withstand a one hundred year storm or flood. The implicit assumption is that larger events are unlikely enough that they can safely be ignored. Climate change complicates the picture, since what was a one hundred year event historically may be a fifty year event forty years in the future. And, to add further complexity, it may also be a forty year event or a sixty year event as a result of climate uncertainty. Climate uncertainty is due to three factors: the lack of knowledge about what future Greenhouse gas emissions will; the fact that climate models are not perfect representations of the real world; and the natural variability of climate and weather due to their chaotic nature (which simply means that very small differences in initial conditions can result in very large differences in the ultimate outcome and is sometimes referred to as the “butterfly effect”). The uncertainty in future emissions is dealt with by examining several different emission scenarios, while comparing multiple climate projections from multiple models (a multimodel ensemble) is a method frequently used to explore the range of possible climate conditions due to natural variability and model differences. From a practical point of view, this means that you can’t base your plans on a precise prediction of what the future climate will be. Instead you need to consider a range of possibilities. 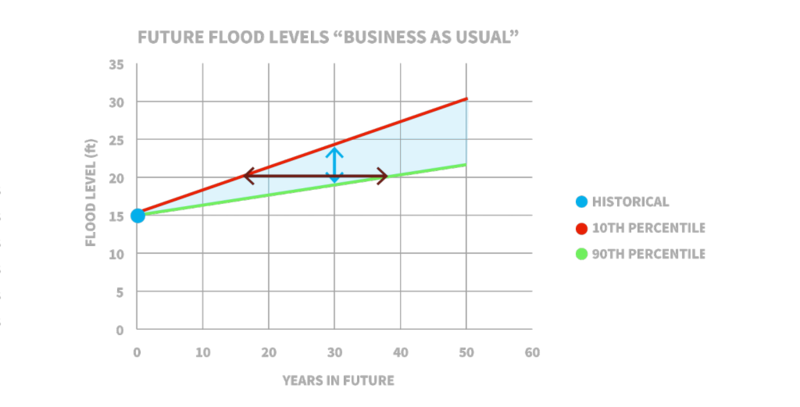 If the historical one hundred year flood level was 15 feet, for example, flood levels of 19 and 24 feet may both be possible thirty years from now as illustrated by the blue line in the hypothetical graph below. Since there is likely a considerable difference in the cost of dealing with 24 feet compared to 19 feet, it’s important to have an understanding of the relative likelihood of those possibilities so you can make a good decision about how much you are willing to spend to limit the level of risk to what you’re willing to tolerate. In the graph, this is represented by where the projected flood levels fall on a percentile distribution derived from an ensemble of climate projections, assuming a “business as usual” emission scenario in the future. There would be a similar graph, with lower flood levels, for an emission scenario with lower future emissions. In many cases, the magnitude of climate impacts, such as the flood levels depicted in the graph, will grow over time, so there is another way of looking at these tradeoffs. Instead of asking what the magnitude of the impact will be in thirty years, you can ask how long measures to protect against 20 feet of flooding will be effective. Again, the answer is a range rather than a single number, in this example 16.7 years at the 90th percentile to 37.5 years at the 10th percentile, as illustrated by the black line. Argos Analytics has developed a portfolio of tools and techniques based on climate projections from the latest climate models to quantify the range of possible future climate conditions. The insight they offer can provide you with a solid basis for making explicit tradeoffs between risk and cost as you formulate your strategy for dealing with climate change. For more information, contact Argos Analytics at info@argosanalytics.com.